This is the shocking moment a woman is violently mugged by a female attacker as passers-by stand back and do nothing. The woman, whose identity has not been revealed, was getting money out of a cash machine in Leytonstone, east London yesterday afternoon when the brutal assault took place. Her attacker was caught on CCTV pretending she was in the queue behind her before throwing herself towards the woman and punching her in the head. The victim, who is seen wearing a pink headscarf and carrying a black shoulder bag, is almost thrown off her feet as she desperately tries to defend herself. The mugger spins her around a number of times trying to take her handbag and repeatedly slapping her in the face. 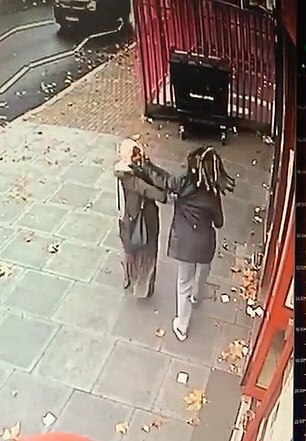 The women grapple with each other for nearly a minute, with the victim putting up a brave defence, before the mugger, seen wearing a black coat and wearing her black and blonde hair in dreadlocks, finally takes the bag and runs way. Meanwhile three pedestrians and a number of cars go by and do not intervene to help. The incident was captured on the local Post Office's CCTV cameras. An employee told MailOnline the woman was 'badly assaulted' and received help from staff inside the Post Office after she was attacked. He said the police were called within 15 minutes of the assault, which has shocked thousands of local residents. The CCTV footage was posted on social media following the assault, which took place just after 3pm outside the Leytonstone High Road Post Office yesterday and has been viewed more than 60,000 times. People commenting praised the efforts of the victim, while others slammed the bystanders who failed to intervene. Neighbouring residents in east London warned other women to be vigilant and wary of potential attackers.